Genotyping refers to the process of determining genetic variations among individuals in a population. Single nucleotide polymorphisms (SNPs) are the most common type of genetic variation and by definition are single-base differences at a specific locus that is found in more than 1% of the population. SNPs can be found in both coding and non-coding regions of the genome and can lead to phenotypic variations when found in coding regions. These genotype changes can confer positive or negative phenotypic outcomes, such as more robust stress tolerance in crops or enhance the susceptibility for disease in humans. Hence, SNPs are often useful markers for understanding the biology of organisms. When found in non-coding regions, SNPs act as markers for evolutionary genomics studies. Related to SNPs are “InDels”, short for insertions and deletions of nucleotides of varying length. As with SNPs, InDels in coding regions can change the amino acid sequence of a protein, either by adding or subtracting an amino acid to the sequence if the indel is in multiples of 3, or by creating a frameshift mutation if the indel is not in a multiple of 3. A third type of genetic variation is copy number variation (CNV), which results from having different numbers of copies of a DNA segment in various genomes. In cases where the copy number variation is for an encoded gene, the variation can lead to susceptibility or resistance to disease. Some phenotypes are also dosage-sensitive, and the copy number is responsible for shades of variability among members of a species. For both SNP genotyping, many methods exist to determine genotype among individuals. The chosen method generally depends on the throughput needs, which is a function of both the number of individuals being genotyped and the number of genotypes being tested for each individual. The chosen method also depends on the amount of sample material available from each individual or sample, which dictates the required sensitivity of the assay. A common large-scale method for genotyping is the use of arrays or sequencing platforms, where large regions of sequence are interrogated simultaneously. This broad approach is best for SNP discovery projects where dozens or a few hundred individuals are tested against hundreds of thousands of potential SNPs to find single base differences among the population. The drawback to this method is the expense of analyzing each sample. For smaller panels of assays it is far more economical to perform genotyping by probe based PCR. Many times, a project does not require the testing of hundreds of thousands of genotypes. Instead, a few thousand samples need to be tested against one to a few hundred known SNPs as in a disease-association study. In this case, microplate-based or array tape methods are preferred where each well represents one sample and one assay. For example, in a 384-well microplate would contain an assay for one SNP. If 16 SNPs are being interrogated, then 24 samples can be tested in one microplate. The microplate-based format lends well to PCR methods of genotyping. This is important, since PCR is sensitive enough to generate good results from limited amounts of sample, such as those coming from paraffin-embedded tissues or small biopsies. Genotyping with dual-labeled probes take advantage of the 5’-nuclease activity of polymerase in combination with fluorescence detection. Four oligonucleotides are used in one SNP genotyping PCR assay: two allele-specific probes that have a single base mismatch and a pair of primers at each end of the SNP of interest. The allele-specific probes are usually labeled with FAM or CAL Fluor® Orange 560 fluorescent dye at one end (reporter), with each probe labeled with a different dye, and a non-fluorescent Black Hole Quencher® dye at the other end (quencher). PCR is carried out with all four oligos in the presence of genomic DNA as the target. When the probes are intact, they show no fluorescence because the reporter and quencher dyes are in close proximity and fluorescence is quenched. The target is amplified by the two primers, and at each extension step of PCR, the probe hybridizes to the DNA strand that complements its sequence. As the polymerase continues to extend, it cleaves the fluorophore from the probe, which now generates a fluorescent signal in the absence of its quencher. A mismatched probe, however, would not hybridize well to its mismatched target, thus remaining intact and exhibiting no fluorescence. Since the dual-labeled probe assay is based on PCR, it is relatively simple to implement. The scale of the assay can be drastically increased by performing many simultaneous reactions high-throughput platforms. LGC Biosearch Technologies offers BHQplus probes for SNP genotyping. BHQplus probes incorporate a duplex-stabilizing chemistry that permits the design of shorter oligonucleotides while maintaining optimal probe melting temperature (Tm) for real-time PCR. These probes demonstrate increased binding specificity, stronger stability, and are less likely to mismatch during hybridization, making them ideal in the analysis of difficult targets such as AT-rich sequences and SNPs. For more information about using BHQplus probes for SNP Genotying, please refer to our poster, Genotyping with BHQplus Probes (PDF 1.8MB). SNP detection can also be done with Molecular Beacons, single-stranded probes designed with complementary stem structures approximately 5 base-pairs in length at each end. The hybridization of the stem structures creates a loop in the non-complementary part of the probe. Attached to one end of the probe is a FAM or CAL Fluor Orange 560 dye, and to the other end is a Black Hole Quencher dye. The stem hybridization brings the fluorophore near the quencher, thus inducing quenching. The sequence of the Molecular Beacon is designed to complement the target, and in SNP genotyping, two beacons are designed per assay; one for each polymorphism.). If the probe sequence of the Molecular Beacon encounters its target genomic DNA during the assay, it will unfold and hybridize to the target. The probe-target hybridization allows the fluorophore to separate from the quencher, therefore emitting fluorescence. Since there is a single-nucleotide difference between the second probe and the target DNA, the second probe does not hybridize to the target and no fluorescence from the probe will be detected. If both fluorophores can be detected in an assay, then the target DNA is heterozygous for both alleles.). Dual-labeled probes and Molecular Beacon can also be used to genotype copy number variations in genomic DNA. In this case, only one probe and two primers are needed, and the amount of fluorescent signal coming from the unknown copy number compared to that coming from a two-copy standard is used to determine the unknown copy number. 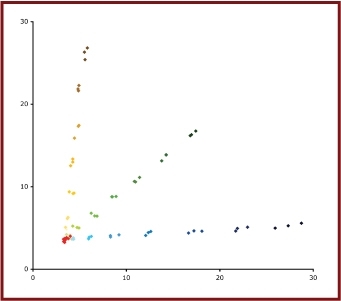 Similar to the real-time PCR method for SNP genotyping, each well in a microplate can contain one assay, and up to 96 individuals (in a 96-well plate) can be genotyped for CNVs in parallel. This method again lends itself to disease-association studies of CNVs as well as stratification of populations for drug studies. 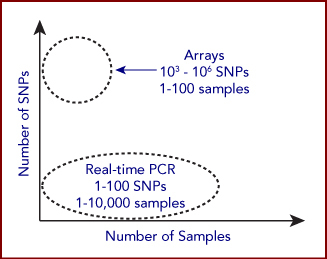 For disease-association studies and population screening, SNP genotyping using a PCR method is the ideal tool. Biosearch facilitates the use of these technologies by offering custom probes and primers. We can synthesize both dual-labeled probes and Molecular Beacon for SNP genotyping. Each allele-specific probe can be labeled with a variety of spectrally distinct fluorescent dyes, and all can be quenched with Black Hole Quencher dye for the best signal-to-noise ratio. Good probe and primers design is essential for successful SNP genotyping. Therefore, Biosearch created RealTimeDesign™ software, a free, web-based assay design application to create SNP genotyping assays with BHQplus probes. RealTimeDesign software incorporates the thermodynamic parameters specific to the chemistry of BHQplus probes, and allows for the design of multiple BHQplus assays in parallel. The application can design assays using pre-set parameters in Express Mode, or advanced users can take advantage of Custom Mode to change settings to fit their needs. With these tools, success is a click away. For more information about designing BHQplus probes, download our RealTimeDesign – BHQplus Probe Brochure.